Emily (Jamie Saunders) is your typical college student living in your typical shared, party geared apartment. It would be great if she was into the party atmosphere many of us remember from college. But she isn't. By nature she is a shy girl who simply wants peace and quiet to pursue her studies. When her estranged grandmother passes away, Emily jumps at the chance to take over her apartment. Finally. Some privacy, space and quiet. Things don't go as planned, as one might have expected. Emily's grandmothers apartment is inhabited by a force so evil, so cunningly deranged, that quite quickly Emily realizes she's made a grave mistake. By this point there isn't much she can do about it. The demonic ramekin won't let her leave. Ever. Adding insult to injury is the ramekin's ability to possess her. Taking over her life. As Emily slowly fades away, and the ramekin becomes more and more in control, it's true intentions are revealed. To bleed the world and everyone within it. In case you are wondering, yes. The evil being of "Ramekin" is in fact, a ramekin. One of those little soup bowl-ish things used for soups or dipping sauces. It communicates with slight movement indicating the word yes, and has the power to instantly create everything from food to cash. An ability it needs in order to stop it's intended possess-ee from ever leaving the apartment. It also has the ability to physically stop a person and yes, even kill someone. It wants to kill someone. It's only weakness? One person at a time. The true nature of this kitchen dish is never actually revealed. So any theories are left open. Ghosts. Aliens. It never really says. Judging by the actions and conversations with this dish, it seems very childlike or naïve, making me imagine maybe the ghost of some long forgotten queen from ancient Egypt. Nothing is ever really said, Emily's possessor could actually "be" an alien. It's just fun to imagine. This was one of the elements I liked about this title. The lack of an explanation. Micro budget titles are notorious for having strange stories and characters. Obviously, "Ramekin" is a perfect example and mixing the lack of backstory, and the unusual entity makes this a blast to hypothesize about. 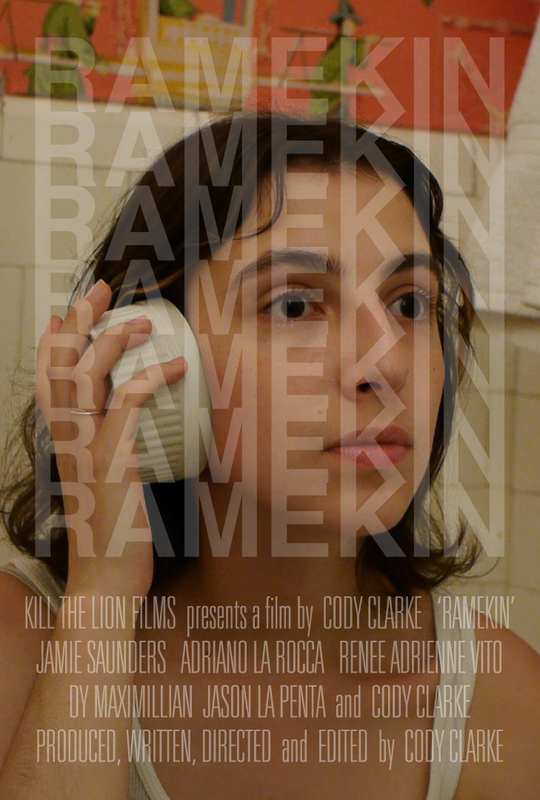 "Ramekin" was written by Cody Clarke, who also happens to be the director making this totally his baby. As far as micro budgeted titles go, this was a pretty well rounded production. It all comes down to the imagery and if you find a girl holding a ramekin like a telephone funny, I have little doubt you'll be amused. There's just something so odd about the entire idea that makes it interesting to witness. The real good stuff comes when Emily is possessed. The way the ramekin doesn't quite grasp expressionism, or the literal take on conversations. Aside from a visual gag placed here and there, most of the humor is in the dialog and dead pan delivery. I couldn't help but think of Data from Star Trek. I also found the poems amusing, although if I actually heard someone reading them off in real life, I would quickly be exiting stage right. For the most part, I found this title refreshing. Interesting in it's craziness. What I didn't really like? The wrap up at the end. Of all the ways to end a title, why that? Kind of spoiled the rest of the movie for me. Favorite part? Every time I heard that annoying buzzing sound the ramekin made. Classic. Two and a half out of five stars.